Almost at the end of the first wall in the competition. 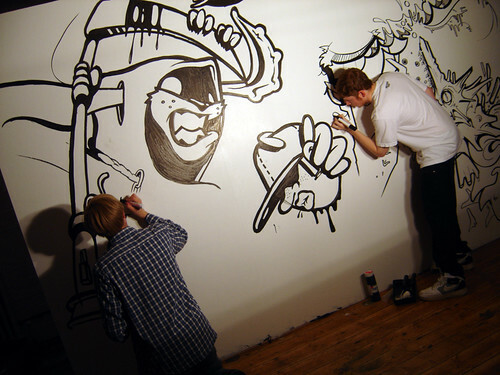 Secret Wars is no your usual graffiti battle and is like watching to comic artists go head to head. So something a little different to report on today but it’s really interesting to me especially the possibilities for my creative practice. I really think this would be a lot of fun to do and although these are a hybrid graffiti/drawing/painting style some of the other competitors go for almost a straight literal illustrative approach. A rare moment as out man checks out the early stages on the opposite wall. 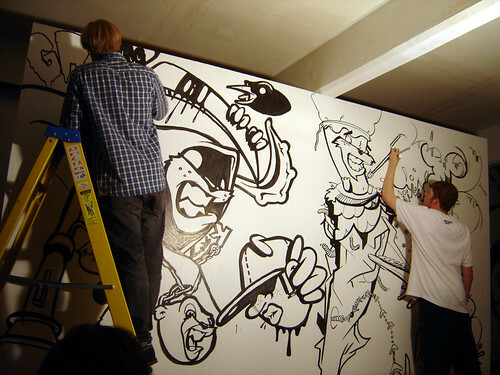 Secret Wars is no your usual graffiti battle and is like watching to comic artists go head to head. Toe to toe as the time counts down. Competitors have 90 minutes to complete there piece with black markers, brushes and rollers, many opt for the marker for the battle but on the other wall they were using brushes. The competition hots up and the ladder is out again in the Secret Wars battle. In a very close call the winner, whose piece you can see behind him on the right is selected. There are two judges and a crowd choice made by a decibel reader. 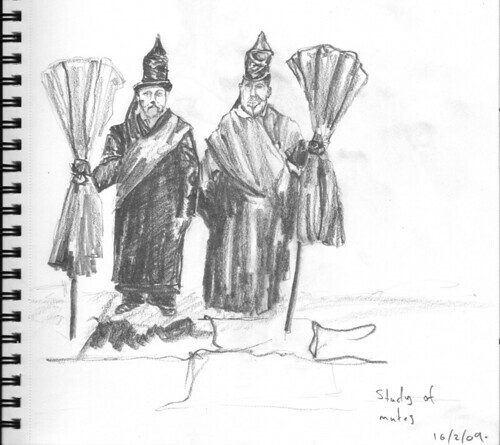 Quick study of Victorian mutes – dressed up and ready to morn! This sketch, a study or a pair of Victorian mutes, was from last week but a great test of my new A3 scanner. Scanning joy! The thing that really got me is that these guys would do some sombre morning for you but you could also hire screaming ladies who would rip at there clothes and that the tradition of ‘professional’ mourners goes back millennia. I find it bizarre that you would pay someone to hang around your funeral (well at least one you’d organised) and weep or look sombre. I just thought we needed something else here a little less grim, so here’s one of my life drawings from last year, also thanks to mr Scan Express. Cheap Mustek A3 scanning action I don’t ordinarily go for cheap but I really wanted to see how much use it would be as a studio tool before I stump up stupid money for the good ones! 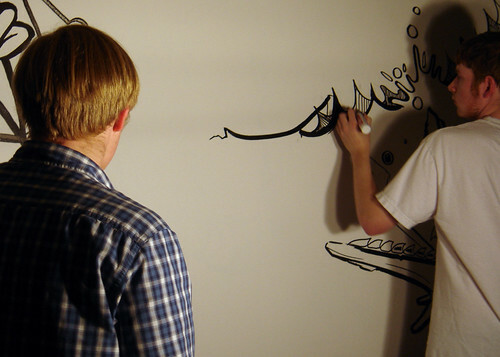 Or maybe I should just draw smaller! 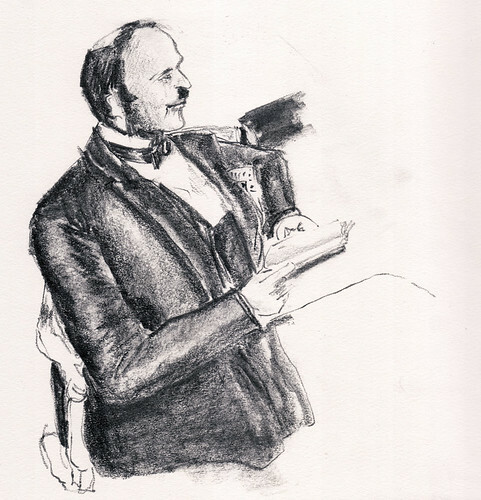 I really enjoyed this very quick research sketch and it seemed like the perfect start to my visual research on Victorian clothing and life. I’m having one of those moments where you see things technically not right but somehow the result is still pleasing. The temptation to ‘fix-it’ oh it’s just very strong but I’ve resisted and it’s possibly why I’ve pretty much just run straight to the scanner. Almost like it will disappear if I don’t digitise it! So that’s my quick sketchiness for today. This is the original sketch and now I’m working on a digitally painted version. So this is a completely digital painting using Painters acrylic brush selection and really just blocking out the tonal ranges at this point. You can still see the faint outline of the source sketch overlayed. I’ve taken my cue from my reading of concept art painting as well as my someone limited knowledge of traditional acrylic painting. The backdrop is something I roughed up in Bryce to give me something to work against. It’s all a bit of an experiment to try and work out a process from sketch to final piece and how best to work. The brushes are surprisingly realistic in there response but the differences take some getting used to. It’s interesting that although you can theoretically paint over and over till you ‘get it right’ that many times it’s better just to move on and leave the imperfections. Absolutely loving my new calligraphy pen. I’ve had the inks for ages but I really like the fluid effect and bold contrast that you get with a calligraphy pen. I went for the vermilion and straight black not really knowing quite how it was going to work together. The black shows up really subdued on this sketch pad but it really works with the burnt orange of the vermilion ink. Definitely going to play around more with this for quick as you like sketches! The idea to buy the pen came from reading Concept Design 2 which I got at christmas. I don’t know why but the whole Undertaker theme seems to be developing. I kind of like the raw Victorian looking characters and I’m starting to exploring more elements hence the hat and the shovel. I’ve been wondering exactly what period clothes look like, detail can be everything or at least interesting. Certainly good to research. 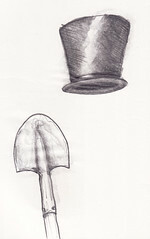 What does a Victorian shovel look like (hehe)! The spaceman is just an experiment although I think he looks a bit more like the Stig than a spaceman.